Word Search World Traveler is the Fantastic New App from David L. Hoyt. 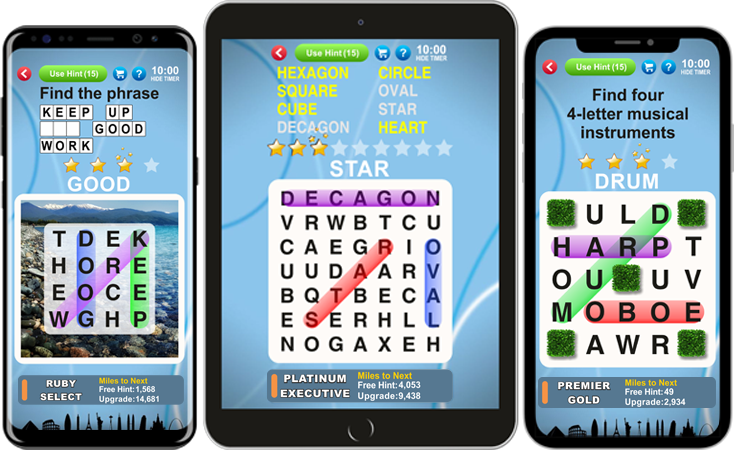 Take word search to a whole new level with this great new app from the author of "Jumble" and inventor of "Just 2 Words", "USA Today Word Roundup" and many more great word games. ● 1,300+ FREE word-search puzzles, and more on the way! ● Awesome DAILY GAMES to keep your brain in shape. ● All puzzles HAND-CRAFTED by David L. Hoyt, the most-syndicated daily puzzle creator in the world. ● Traditional WORD SEARCH like you’ve never seen it before. ● Daily REWARDS and lots of BONUSES! ● Tons of great THEMES and puzzle FORMATS- there’s always something new to discover. Word Search World Traveler is great fun for players of all ages- it's even something the whole family can take part in! David has brought all his puzzle-writing experience to bear and created a word-search app that takes the idea of word search and turns it on its ear by combining it with different puzzles and games. Come along with David on a Word Search World Traveler adventure! Millions of people love his engaging word find games, and we think you will too! If you’re a word finder looking for your new favorite free game, “Word Search World Traveler” is the top game for you! It is word search + so much more. It's another fantastic word-search game from David L. Hoyt- the most-syndicated daily word puzzle creator in the world!